Good morning Nic...You are quite the evil torturer...& then leaving a note that you've won the book...LOL!! Good for you! Am glad you are doing justice to the book. These are gorgeous...crust & all. Was at a loose end this morning & made a chocolate custard creme caramel. These are definitely sinful...gotto try these SOON!! those are stunning muffins. thanks for your entry. Oh, Nic, these are absolutely gorgeous!! I'm so gonna try them :) Thanks! They sound so so good! I must say, those are the most perfectly risen, beautifully cracked looking muffins I have ever seen! These are just fantastic - muffins are good, I'll say, but these are sinful! Quite a treat. Those look beautiful. I'd feel guilty eating those for breakfast...lol, but it wouldn't stop me for a second. I am just wondering, will I get the same results if I used commercial chocolate pudding instead of the custard? Thanks. Oh good grief! These look amazing! I can't stand it! They are perfect! Delicious! May I have one? Now they really are 'superlicious' muffins!! I think that your family will love you forever making these chocolate muffins! Surely you will win the click constest with that photo! Perfect! The recipe for these muffins sounds wonderful. Custard! Chocolate! It can get no better. These look amazing, decadent, scrumptious... And the crust looks so worthy of the "click" event. Oh my. The name of these muffins alone had my tastebuds dancing. 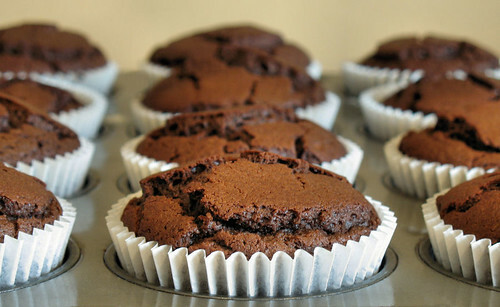 Wow Nic these Chocolate Custard Muffins look and sound so yummy! I've had a headache all day, but I think I've found the cure. Gorgeous! these must be to die for! Those crusts look perfect, my first time at your blog, and I am bowled over. Nice click. Those look and sound scrumptious. I have been trying to think of what to do with a bar of dark chocolate I brought back from Switzerland. I think this could be it! The crust.. Oh my the crust. Looks perfect.. Have never tried Lepard's non-yeasted recipes but that's going to change soon. Hi Deeba - ha ha, this recipe isn't actually from that book, but it is a good one! Raquel - hope you have a good week too! Bee - thanks for all your hard work on 'click'. Miri, Sam, Helen, Patricia and Beth - thank you all! Mike - I've had one for breakfast and I really didn't feel that guilty, lol! Lalaine - hi there, thanks for popping by. I really don't know about the chocolate pudding as we don't get it here, sorry. Leonor de Sousa Bastos - thanks so much, and they taste pretty good! Ben - thanks!! Me too. SGCC - thanks but not perfect - yummy all the same. Ginny - sure - I'll send some over! Nina - thanks, but there are tons of great photos over there. Jan - I'm glad to see you like my new word! Margaret, Robin Sue, Grace - thank you! Snooky doodle - thanks for visiting and hope you give them a go. Alexa, Marysol, Maria, LyB, Dee, [eatingclub] Vancouver, Aran - thank you all! Divya - welcome to my blog and thanks for your comments. Lisa - if you bought back some special chocolate, I would eat it 'neat' - almost any plain dk choc would be ok in this recipe. Jude - Dan has a recipe every week in magazine (link above), take a look at some of them. chocolate custard muffins?! how amazing! i can only imagine what the inside looks like...YUM! Fantastic idea! They look sinful! chocolate is so soothing to my eyes !! these muffins look so comforting n warm, n just ready to be eaten ! These sounds like something from a really happy dream I once had and sound lush! Will be definately trying these soon! I agree with Deeba...how can you post this chocolatey goodness for me to see at breakfast time...wink...wink....Congrats on winning the book!!!! This is a definite to try. On tomorrow's list of things to do. I am an American and I wanted to give these a whirl because they so yummy! I had a question though... cornflour in the US is yellow mealy product used typically to make corn bread. I was wondering if the cornflour in this recipe was actually cornstarch (US)? Cara - cornflour is indeed cornstarch in the US, thanks for pointing this out. I have added this information to the ingredients list!